This book explores the challenges of cross-cultural translation of American literary works into Arabic which, I argue, have prevented many nineteenth-century literary works from being translated into Arabic. I have used the Arabic translations of Harriet Beecher Stowe‘s Uncle Tom’s Cabin and an abridged English text accompanying one of the translations as a case study. Since most of the Arabic translations of English and especially American literary works are merely linguistic oriented ones, I reinforce the importance of adopting a period-specific cultural-oriented approach that maintains the cultural context of American literary works, including the historical, cultural, religious, geopolitical, and gender-based elements, during the literary translation into the Arabic culture. I start with discussing the internationalization of American works and the importance of a cultural reading of these works. Reviewing many translations of English and American works in general, I categorize the challenges of cross-cultural literary translation from English into Arabic into the following: cultural, religious, geopolitical, and gender-based ones. While I am not calling for accurate cross-cultural literary translations since it is impossible, however, I am advocating for faithful translations which maintain the literary text‘s cultural and historical contexts. The accuracy of a literary translation depends on the amount of linguistic skill a translator has while the faithfulness of a literary translation is based upon the translator‘s sincere effort to include the literary text‘s entire cultural context including the historical, cultural, religious, geopolitical, and gender-based elements. Using Uncle Tom’s Cabin as a case study, I discuss how the previous challenges had negatively affected the translation process of the work. Despite the fact the work has been translated seven times into Arabic, due to the linguistic-oriented approach, the historical and cultural significance of Stowe‘s novel has not yet been introduced to Arab readers through translation. 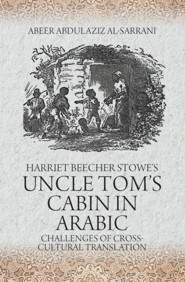 Due to the current era of globalization that demands individuals to have multicultural knowledge and understanding and due to the recent cultural and translation projects of literary works from English into Arabic, this book reinforces the importance and possibility of addressing the cultural, religious, geopolitical, and gender-based challenges while using Uncle Tom’s Cabin as an example.